Just who is Yingluck Shinawatra? Yingluck Shinawatra, the first woman to attain the highest political office in Thailand (see WVoN story), is a successful businesswoman and the product of a “well-oiled political machine”. Until now Shinawatra, 44, pursued a corporate career and is currently president of SC Asset, a family business. She has two degrees in politics – an undergraduate from the northern city of Chiang Mai, her family’s powerbase, and a masters from Kentucky State University in the US. In her bid to become the first female prime minister, Shinawatra said she planned to use her attributes as a woman to promote national reconciliation and asked for the chance to prove herself. Commentators point out that she is being advised by a formidable array of veteran politicians, including some of the traditional powerhouses of Thai politics. The youngest of nine children, her elder brother is a former prime minister, Thaksin Shinawatra, who was ousted in a 2006 military coup. She was the number one party list candidate for the main opposition Pheu Thai political party, which her brother still effectively controls despite living in self-imposed exile in Dubai to evade a two-year jail sentence for corruption. 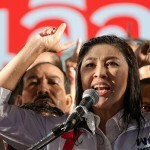 Shinawatra mobilised party supporters faithful to her brother through democratic elections as opposed to the prolonged – sometimes bloody – street protests that Thailand has witnessed in recent years.